Cyclocross is the dread of the drive train. No worries, though. You’ve just found the WickWerks shifting advantage in the form of high-performance chainrings made to shift faster, shift more dependably, and shift even when conditions are rough. 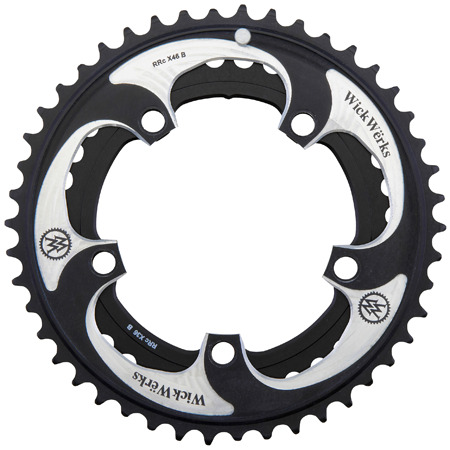 WickWërks chainrings have multiple bridges spread out every three, four or five teeth, providing a fast positive engagement of the chain no matter where in the crank set revolution you’re shifting. WickWërks chainrings have low profile teeth off of each bridge and an angled area above the top portion of each bridge that allow the chain to lean in and mesh smoothly into the next ring during an up-shift. The low profile teeth around the WickWërks chainrings allow the front derailleur cage to physically move the chain past a cut tooth allowing for faster downshifts, especially under load.WickWërks Standard Cyclocross Chainrings are compatible with compact, 110 mm BCD cranksets. 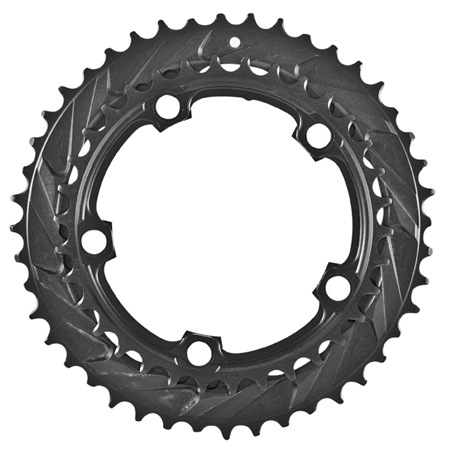 compact BCD chainrings are available in 46T/36T, 44T/34T and 42T/34T combinations. Sold in a outer/inner pair. Weighs 111 grams (44T/34T).